This week in foodie fun starts with a Tax Day special and finishes up with a whisky truck at a popular Houston restaurant. In between, there’s a local chef competing on Beat Bobby Flay, a four-course whiskey dinner at the Dunlavy, and a popup at Glitter Karaoke. Here, then, is a roundup of the best food and drink events happening this week in Houston. All pizzas are $4.15 all day long at the West Houston upscale casual spot. Every pie on the menu is customizable, giving diners a plethora of choices when it comes to crusts, sauces and toppings. It’s all designed to take a bit of the sting out of Tax Day. The restaurant opens at 11 am. The four-course dinner begins with a cocktail hour of passed appetizers and whisky cocktail pairings. During the sit-down dinner, Balcones Distilling Brand Ambassador Winston Edwards guides guests through whiskey pairings with Chef Jane’s selections. The menu includes a crab boil salad accompanied by Balcones Bourbon, and Pork N’ Beans, paired with Balcones Baby Blue. Ticket are $85 per person. For reservations, call 713-360-6477. Bar guru Dave Arnold joins UB Preserv for Southern Smoke Spring. 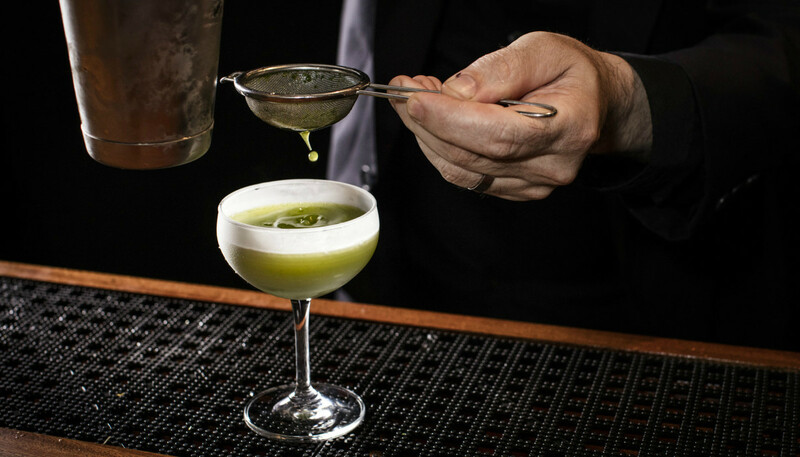 He’ll serve a selection of cocktails from his NYC bar Existing Conditions, as well as incorporating some of the original techniques and technology from his lab, Booker and Dax, including his culinary centrifuge, the Spinzall. Proceeds from this special cocktail menu will benefit Southern Smoke Spring. Event runs 9pm to 2 am. With menu highlights that include Fried Chickun, BBQ, Mac N Cheeze, Jambalaya, Cajun Corn, Beer-Cheeze Battered Beyond Burgers, Totchos, and more, this soul food-inspired event adds some spice to the middle of the week. Diners can select their favorites from 5 to 10 pm. Come out from 6 to 11pm and cheer on Houston’s Chef Rosh as she takes on Bobby Flay. No stranger to television competitions, she won Chopped and was a contestant on season 10 of Hell’s Kitchen. The show airs at 7 pm, but there are food and drink specials all night long. Chef Ryan Lachaine is back at Glitter Karaoke for a reprisal last year’s popular popup. He’s making an assortment of dogs including Riel’s Mini Dogs (egg yolk, fried rice, Gochujang), a Deli Dog inspired by Luda’s in his hometown of Winnipeg (onions, Kraft singles, bacon, relish, mustard), Slaw Dog inspired by The Varsity in Atlanta (chili and dirty coleslaw) and a Tonkatsu Dog (kewpie mayo, bulldog sauce, pickled cabbage, bread crumbs). The event kicks off at 8 pm. The Monkey Mixer, Monkey Shoulder Scotch’s 27-foot-long traveling cocktail truck, will make a stop in Houston. Monkey fans can look for it on Bosscat’s back patio at the restaurant’s 4310 Westheimer Rd. location. Given The Monkey Mixer can hold up to 2,400 gallons of liquid, expect ample samples to be served. Event runs 3 to 5 pm.